Feeling like you’ve been bitten by the travel bug? We sure have! 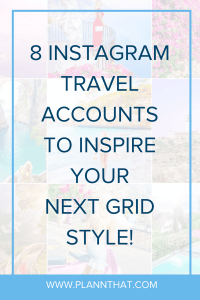 Today we’re on the edge of our seats because we are so freakin’ excited to share with you our top picks for 8 travel Instagram accounts that are definitely going to inspire your next adventure or better yet, an Instagram grid style makeover. It’s the perfect time to gather some inspo! Sit down, grab a chunky knit blanket, make a cup of tea, and let’s scroll through some travel Instagram accounts together and decide where you’ll be visiting next. Get ready for some serious #travelinspo. Better dust off + bring out your suitcases!! @mytravelsecret on Instagram is the master of the two-colored Instagram grid. A quick scroll through this Instagram account gives us instant travel inspo – where is the nearest palm tree?! 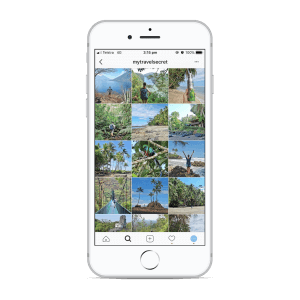 In all seriousness, this Instagram grid style can be achieved by being careful about what exactly you are taking photos of. When you are out and about consider what colors feature in the landscape that you are taking photos of – keep an eye out for your favorites! @lichipan is the ultimate travel Instagram account for beautiful, magazine-like photos. This travel Instagram grid will inspire you with drool-worthy food photos, architecture that wows, and landscapes that are truly breathtaking. 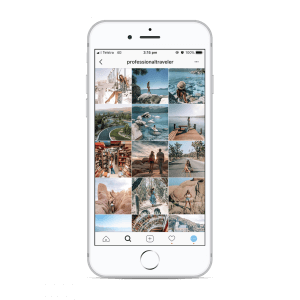 You can re-create this Instagram grid style by making sure to take a variety of photos like outfit photos, food photos, architecture photos and landscape photos. 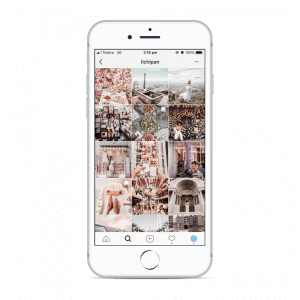 After you’ve got your pretty pictures you can upload them to an app like Plann, and then drag and drop to create a flowing Instagram grid style. 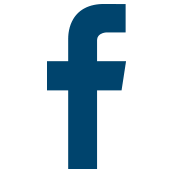 @professionaltraveler is a… you guessed it… professional traveler AKA digital nomad. And guess what? We’re totally jealous! This travel Instagram grid style is also pretty snazzy – we really love the mix of cool-toned photos that has definitely been achieved with some sort of photo-filter magic. PSST -> Did you know that our Plann app includes over 60+ professional filters that are completely free? Woop Woop! Here is some photo-editing inspo for you. @mynextwanderlust has an absolutely eye-catching Instagram grid style, it’s very unique and it completely transports us into her perfect Instagram world within a matter of seconds. 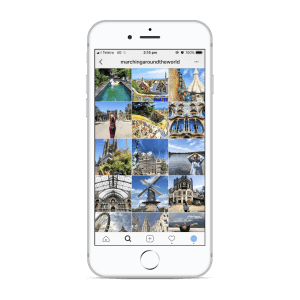 To create an Instagram grid like this you need to, first of all, take some ah-maaazing photos, and then once you’ve done that, you need to decide on a signature filter to use on all of those travelling pics. Is anyone else dreaming of running off and becoming an Instagram travel influencer? Want to learn how? Take a quick look over this blog that will teach you exactly how you can become a travel influencer too! @thecolorsofsam has us absolutely swooning over this color-filled Instagram grid! 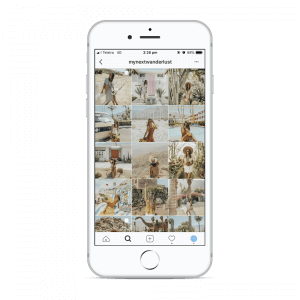 Would you try this grid style out on your own Instagram account? We’d love to see! 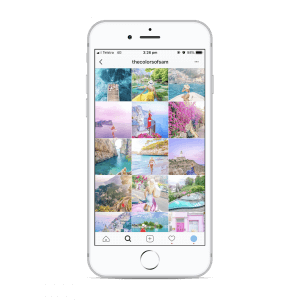 @serenastravel has a very Instagram-worthy travel account and we are so excited to be sharing it with you today. Pack us in your suitcase and take us with you next time, Serena! 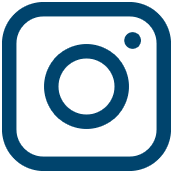 Ever thought about having a night + day Instagram account? 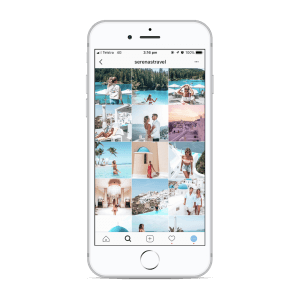 We love the vibe of the @twosometravellers grid. It’s giving us a major throwback to the oh-so-popular Instagram grid styling method, known as the ‘checkerboard’. All you need to do is make sure that you’re snapping photos during the day, and at nighttime. Seems easy enough right? We think this is a great grid-styling method to try out for a bit of a change. Love a wee bit of architecture mixed in with a gradient-style Instagram grid? You’re going to love the @marchingaroundtheworld Instagram account. 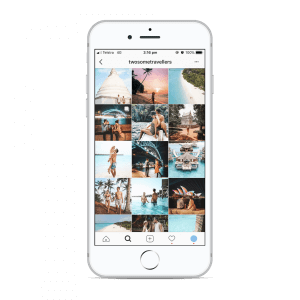 PSST -> Once you’ve mastered the art of travel Instagram account styling, you can move onto perfecting your Instagram captions with the help of this ah-maaazing blog post. Yahoo! There you have it, eight of the best travel Instagram accounts that are definitely going to inspire your next adventure or Instagram grid makeover. Why not do both? Yaaas! We can’t wait to find out which account you loved the most – make sure to let us know by leaving a comment on this blog, or better yet, going to the Instagram account that you’ve fallen in love with and letting them know that @plannthat sent you ?